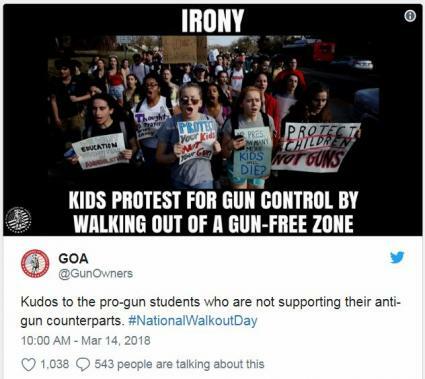 What should students and parents do about armed protesters at anti-gun violence walkouts? Ban the open carry of firearms in their community. Hey Walkout students, I read some stories about armed jerks showing up at protests. If this happened at yours there is something you can do about it. These stories got me thinking. How should students and their parents respond when people show up at their event armed with guns? I think they should get open carry of firearms banned in their community. Below I explain how to make it so. 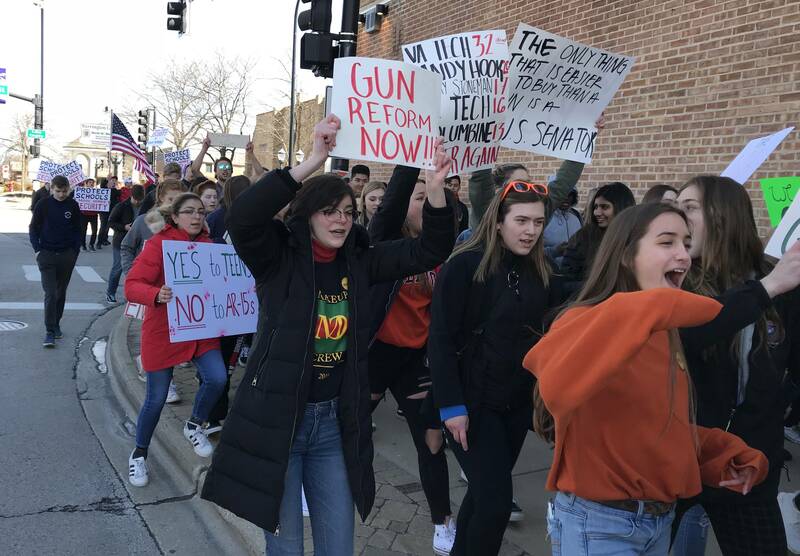 Before the March 14 protest, my friend Eric Milgram, spokesperson for the Newtown Action Alliance, shared the story of the pro-gun rally in Romeoville by a woman named Savannah Denvir. A group called Overpasses America supported the protest. "There may be armed protestors at the pro-gun rally, according to Denvir, who doesn't know if people plan on arriving armed. She said it's their freedom to choose whether or not to carry a weapon. 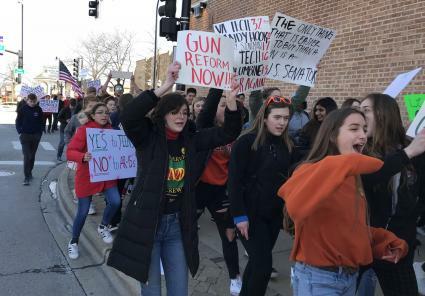 Romeoville Deputy Police Chief Steve Lucchesi said police will be present at the school for both the student walkout and the 2nd Amendment rally. "We're there to make sure everybody is safe," he said. "parents and students alerted Romeoville police Tuesday of a post with a male student holding a firearm, which several students commented on and shared. Police investigated and determined it was an air-soft gun, and that the post was not a legitimate threat." Who was the guy in the Instagram? I couldn't find that photo, but I did find this one. Now, since I'm a logical Vulcan from the future, I can tell you that banning open carry is possible and now is a great time to do it. The NRA is on the defensive. Local elected officials, sheriffs and police HATE armed protests. A group of motivated young people can make this happen. I can explain the process, what to expect from the NRA, legislators and adults and how to make it so. If you are interested, keep reading. If I was at the Romeoville student walkout and I saw these people with guns protesting, I would go over there with my phone and get video and audio of all of them. I would ask them questions and see if they identified themselves. I've dealt with people in the Open Carry movement before. Most likely they would be prepared and would video record of me right back. They would eagerly point out, "We aren't breaking any laws!" Sure, not now. But if you did a background search of these people what would it reveal? 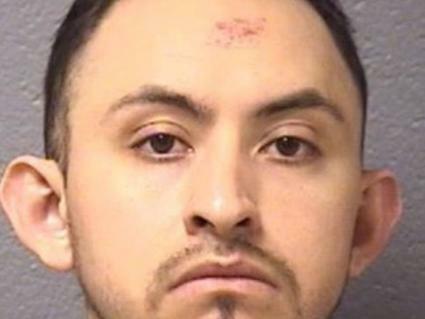 A history of domestic violence like Luis Ugalde's? "Ugalde has prior arrests for domestic battery and violating an order of protection." What you couldn't find, but the police could, is if they have a concealed carry permit. However, some like to brag about their permit and will tell you if they are packing. It's good to know these things. Learning about local people with guns protesting is just part of the story. Banning open carry in a community will bring out the NRA and their vocal supporters. Like Gun Owners of America, who think this gem is hilarious. I think this would be a good exercise in civics for students AND their parents. If they start this process they will learn just how unhinged, clever and motivated pro-gun groups are. Prepare for this, then use it to your advantage. 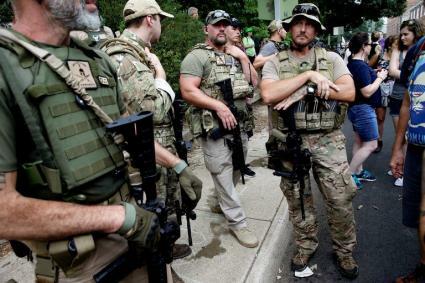 The people involved with open carry and armed protest count on three things to protect them. They know the media. Coverage often focuses on the law, the technicalities of the First amendment, 2nd Amendment, state and local gun ordinances. The media rarely discusses the blatant intimidation that an armed protest represents to the people in and around the protest. Yes, there will be NRA money involved, financial pressure on elected officials is SOP for most lobbyists. But it's not just about the money, gun lobbyists have a passionate, vocal, politically active group whose value system and self-identity is often tied to their ability to own, use and carry guns. But things have changed. There is a vocal, politically-active group against the slaughter lobby. If students and parents start working on blocking open carry, gun bullies will show up. Some will claim victimhood "You aren't letting us exercise our 2nd Amendment rights!" 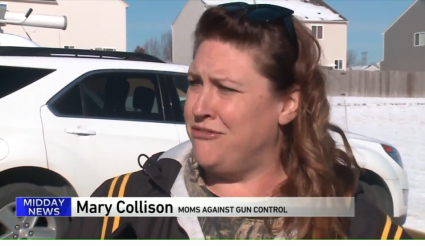 In the clip above Mary Collison, of Moms Against Gun Control, gunsplains that it's not a gun problem, it's a people problem." Others will talk about about how they just want to protect students and that more guns is the only answer to 'bad guys with guns." Others will offer up heroic shooting scenarios out of movie fantasies. These people might be fun to engage with online if you are into that. But I want people to be aware of the jerks that make threats, because there are new methods and IT tools to find them and deal with them. Cybergun bullies like to do research and say, "We know where you live and go to school." They could be local, national or international. When police are trying to determine how serious to take threats they try to figure out where the person is located and how credible is the threat. Although the police have additional investigative power that individuals don't, they often don't have time or resources to follow up. But there are other options. There are special tools that can help track down these threats? Some threats can lead to civil lawsuits against the person making the threat? There are lawyers available to help with these cases pro bono? Most employers have policies forbidding employees from threatening to kill people? If the person is tried and convicted of a felony, they will be unable to own a gun or get a legal concealed carry licence? Adults will be shocked that someone would send death threats. In this case they saw instantly on Instagram a threat. For some, threats will be a reason to pull back in the work. For others it is an opportunity to push back on the intimidation tactics and ensure that there are consequences for threatening speech. I believe things are different Post Parkland. As my EFF lawyer reminded me, threatening speech is not protected speech. If people threaten you with words it could be illegal. If they use both words AND a gun that too can be illegal. 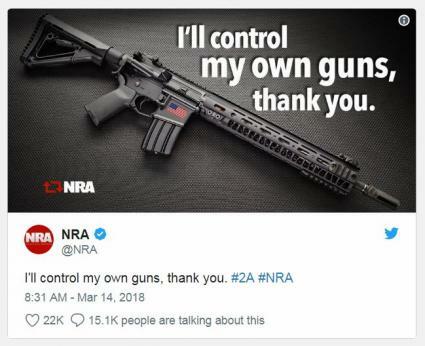 One of the long-term strategies of the NRA-ILA is to make actions that reasonable people agree should be illegal, legal. There are many reasons for this strategy, including the ability to buy the legislators who pass or block the laws. One of the laws that the NRA-ILA didn't block was section 1362 in the " Marjory Stoneman Douglas High School Public Safety Act" It is about the consequences to people making threats to kill or bodily injury others. It makes doing this a felony in the second degree. This means someone who is convicted of sending death threats to a Parkland shooting survivor who is working on changing our gun laws, could lose their money, job, guns and freedom--which is not the same as their gun, even if they think it is. Live long and prosper Romeoville High School students!